I love piles of pillows - whether on top of a bed or couch. They scream to me: "Get a book, curl up for while and forget the world." Whatever your style - modern, country, shabby chic - there's a pillow with type in today's roundup. 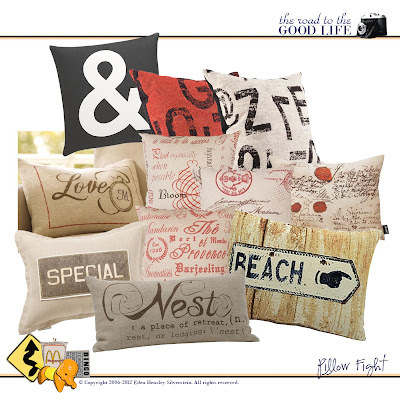 The Finds (top row, left to right): 16" And Pillow, $29.95; 24" Graffiti Square Pillow, Red, Ivory, $119. (second row, left to right): 12" x 16" Valentine Boudoir Pillow Cover, $29; 16 1/2" Garden Square Pillow, $26.99; 16 1/2" French Laundry Square Pillow, $26.99; 15" x 22" Lava Lite Beige / Red Wax Pillow, $27.99. (third row, left to right): 12" x 16" Special Patch Pillow, $9.99; 16 1/2" Tea Square Pillow, $26.99; 13" x 20" Beach Pillow, $18. (front): 12" x 24" Nest Pillow, $49.50. What's your stance on throw pillows: Cozy or Clutter? Credits: All images taken by their respective sellers: Crate and Barrel, JCPenney, Pottery Barn, Room and Board, and Target. Collage created by Eden Hensley Silverstein for The Road to the Good Life.